Classic test series are defined by the men who are in charge. Think of the two best series in recent times - Ashes 2005 and the 2001 Australia tour of India. While players like Flintoff, Harbhajan, Laxman and Hayden deservedly walked away with all the plaudits, their performances were shaped by the men who led them. Men who believed in their abilities and knew how to get the best out of them. Michael Vaughan’s best contribution to English cricket might have been his handling of Big Freddie, who responded to his captain, like he did to no other. Harbhajan and Laxman were backed tirelessly by Ganguly, who was repaid for his unwavering support, with once in a lifetime performances. Likewise, Hayden who was in and out of the team till the 2001 series, credits Steve Waugh for the faith reposed in him, during the tough times. Great performances are dime a dozen, but great leadership is harder to find. Times have changed since then. Australia is sitting at an unfamiliar position in the rankings, England have managed to develop a semblance of consistency and India are at the top of the table. These teams are well reflected by their leaders. Dhoni’s captaincy might be considered lucky, due to the players at his disposal; but you try managing a team which contains among many others – a man considered to be God’s equivalent in cricket and a slap-happy, hot blooded Sikh who seems to be undergoing a major cricket-related identity crisis. Dhoni has a wealth of talent at his table, but they all speak different languages and have their own cultures. To blend them into a successful unit and transfer his brand of ‘cool’ onto the team – it is not by chance that India are playing well, and are actually holding onto their top ranked position, which is much tougher than getting there in the first place. But I digress. This is about the two men in the hot seats. Andrew Strauss and Ricky Ponting. Two men, who are perfect microcosms of the teams they lead. Their performances at the Gabba, stayed true to type, and confirmed the roles, they are going to play over the next few weeks. 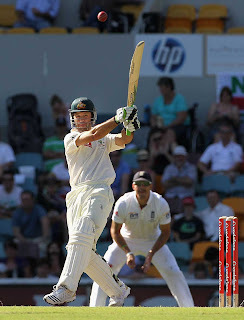 Strauss is in good nick and proved that the first innings duck, was a minor aberration. Ponting is not exactly the batsman, who he was a few years ago; but he brings the same bloody-minded attitude and doggedness to the crease every time he strides out, and which his predecessors had in abundance. 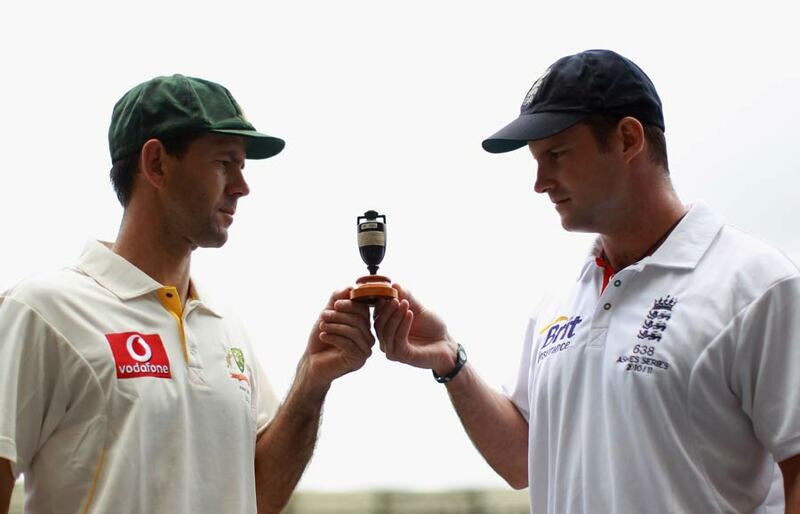 And, in a series between two middle ranked teams and with possibly one other world class performer, these two will decide the fate of the urn. 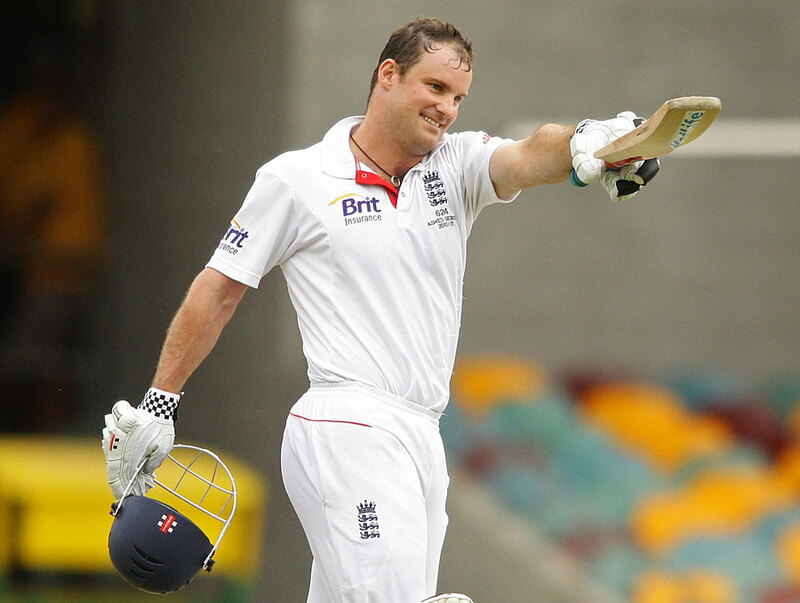 Andrew Strauss is the right man at the right time to lead England. Like many, I felt that he should have been the skipper on the previous tour down under; but that was because of the poor alternative choice. Flintoff was no captaincy material, and England paid dearly for their choice, for perhaps the most grueling trip there is, in cricket. Strauss might not have made much of a difference, considering the blood thirsty mood, the Aussie legends were in; but you could rest assured, that he wouldn’t arrive at the nets, drunk; and he would have brought a sense of calm amongst the madness and panic which plagued the team on that tour. In a way, that tour, set in motion, a chain of events, which led to a poor run of form, and a subsequent removal from the ODI squad; and soon, he was at the crossroads of his Test career at well. Good cricketers usually choose such moments to stamp their authority on the game, and Strauss duly did that with a marathon innings of 177 in New Zealand in early 2008. Soon, he was belatedly given the captaincy, when the Pietersen - Moores combination ended in flames. Since then, he has barely put a foot wrong. In the way, Anil Kumble was the perfect man to be at the helm during the controversy ridden India tour of Australia in 2007-08, Strauss was the ideal man to be in charge of the team earlier this year, when Pakistan toured, and an inevitable controversy broke out. He handled the subsequent storm well and made sure that England maintained their focus on the ball. If anybody had doubts over his credentials as a leader till then, those few weeks converted them all. As captain, Strauss averages 47.6, compared to his overall average of 43.3; and against Australia, he averages a distinguished 53 after 6 games. While these stats are all well and good, the following piece of statistics is worth noting (courtesy of Cricinfo): in the first match of a series, he scores on an average, 39 runs; and in the 2nd match, it jumps to 60 and 52 in the 3rd match. While it dips to 38, in the 4th match, it jumps right back up and above to 71 in the 5th match. Going by that trend, he is all set for a cracking match at Adelaide and Sydney! More importantly, it shows a man who is aware of his responsibility and sets an example for his men. He has already played a few classic innings in the Ashes, none more so than the 161 at Lord’s last year. He is a man comfortable in a captain’s skin, and obviously relishes the burden which the likes of Vaughan and Pietersen couldn’t handle. When put in front of a microphone, he spouts phrases from ‘Cricket Cliches 101’ and is careful to avoid making controversial and even gung-ho statements; but the way he, along with Flower, handled the likes of Pietersen, Broad, Swann and Anderson, and molded them into a consistent, successful team is no mean feat. He may not be the best tactician on the field, but he is aware that, history beckons him to be the first Ashes winning skipper in Australia for England, in over 20 years; and so far, he has made all the right moves, on and off the field. His players respect him, his coach trusts him, and the hopes of the cricket loving public of England, rests on his shoulder. Life will go on beyond the Ashes for Andrew Strauss, and contests with India and South Africa will determine his legacy as a world-beating leader, and with a team on the ascendancy, greater achievements are possible; but for now, retaining the Ashes will do just fine. His opposite number is as different from him as he could possibly be. 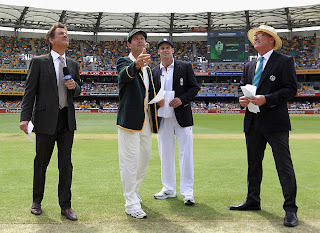 Ponting’s background, batting style, manner on the cricket field and talent at disposal, are the antithesis of Strauss’. When Ponting became captain of the Test squad, Australia were the number one team in the world, with the likes of Ware, McGrath, Gilchrist, Hayden and Langer by his side. And everyone knows how it has turned out since then. Where once he had Martyn as a reliable ally in the middle order, he now has North; and replacing the role of strike bowler, which was filled by the likes of McGrath and Lee recently, he now has the enigma that is Johnson. While his record as ODI skipper will please him, losing the Ashes twice, with the possibility of losing a third time, that too, at home, will irk him no end. He is the right man to lead Australia, but unfortunately at the wrong time. He does better, when he can lead through sheer weight of performances and doesn’t have to cajole the likes of Johnson, and expend his energy in finding a suitable replacement for Warne. With a pack of world beaters at his side, he was free to bat like the champion he is, and expect the others to do their jobs. I never rated him highly as a tactician even then, and now, when a situation calls for smart captaincy, his shortcomings are there for all to see. That is not to say, he is a poor leader; he has the respect and loyalty of his team mates, who know his value to the side. It is just, that he lacks the tactical nous needed to get the best out of the bunch of players that he is saddled with. Neither does he possess the placidity or diplomacy of Strauss. Prone to provocative statements, age has forced him to mellow down, and he is surprisingly gracious nowadays. Still, once in a while, he lets his guard down, and the passion which is often mistaken for arrogance shines through. That is why, when Kumble complained after the Sydney test, that only one team was playing in the right spirit, not many rushed to Ponting’s defense. While the likes of Waugh and Taylor were held in high regard by their peers, Ponting was rarely revered in the same manner. No wonder then, that when England defeated Australia in spectacular style to win the Ashes in 2005, the reaction in the cricket universe was akin to the world’s reaction to the election of Barack Obama. Of course, Ponting doesn’t care about such trivialities and continued to pile on the runs, winning matches for Australia against every other opponent. Now, his powers are on the wane, and he is expected to carry the batting against an English side which refuses to play by the script, and is hell bent on further tarnishing his record as skipper; but even the Englishmen know that, to win a series this time around, they will have to go over Ponting’s dead body (metaphorically! ); to that end, his innings on the 5th day at the Gabba was a good indication of the scrap left in him. If only, he can inspire his team mates, to play at a level, higher than the one that they are currently stuck in, this Ashes will remain a worthy contest. 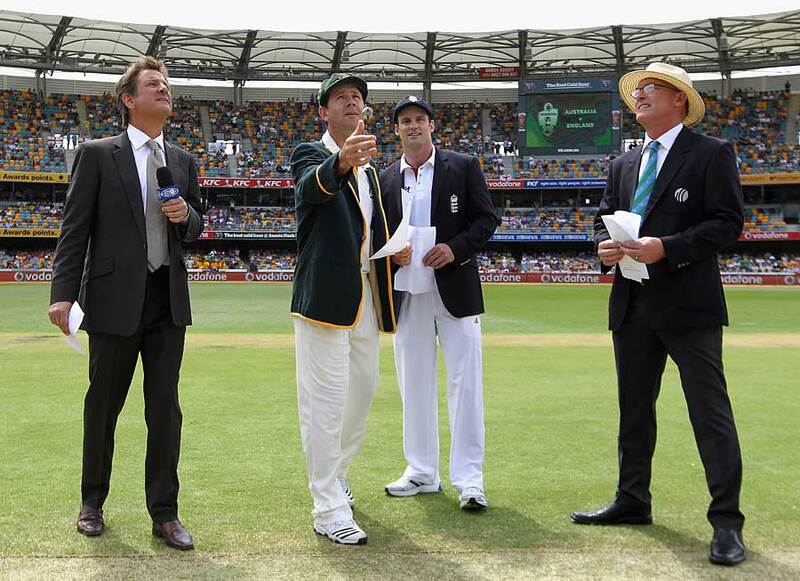 Otherwise, Ponting could be finding himself at the wrong end of history again. Strauss and Ponting are at two different spectrums of their captaincies; but their journey to the present stage in their careers has had its fair shares of twists and turns and each of them has evolved according to the relative performance of the teams they lead. While they are as different as chalk and cheese in most facets of their cricket, they have one thing in common; a burning desire, come January 7, 2011, to hold an urn, which can make or break their respective legacies. tracerbullet007 blogs at Like a Tracer Bullet. To waste your precious time, head over there!